A smooth riding all-weather radial, the Wrangler RT/S is also capable of handling off-highway duties. The computer optimized tread design makes this a comfortable riding, versatile performer in a wide range of conditions. Look Good. Work OK on perfect road conditions. I just had a hydroplaning accident with these tires on my vehicle. I had 0 control over the vehicle. After wondering if I did anything wrong, I Googled these tires about hydroplaning and was amazed at the epidemic of hydroplaning complaints. These tires are dangerous to drive on wet roads. Great tire for the price. I had Michelins on vehicle first but they were well over $600 to replace. Poor traction in rain - hydroplaning. Really marginal tracton in snow. Even after repeated balancing and rotation after about twenty K miles tread starts scalloping and then impossible to balance. Second set on this vehicle. Same exact problems as the first set. Will be switching brand and model next week. 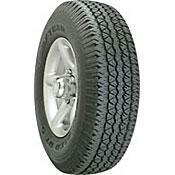 Good tires in a dry enviroment assuming you want to replace them every thrity thousand miles. I got 65000 miles out of my first set and Im going on 40000 on second set...Rotate every time you change your oil and keep inflated properly and you get more than what they claim. Most people love these tires! i have a 1999 ford explorer sport i have had these tires on for 17000 miles. the first 5 thousand miles were good then the truck was vibrating and very noisy. i went back to where the tires were installed numerous times with no luck. May be good valued for light duty vehicles and light duty highway driving. Not for heavier trucks and adverse driving conditions. Seemed like a good value at first, but the tread began to "scallop" at 30K+ miles even with regular rotations. Then at 40k one tire went flat as a result of the the sidewall spitting open almost halfway around near the rim. Fortunately the sidewall gave out while the van was parked and not at highway speed. And after reading other reviews of hydroplaning I'm reminded of my own experiences of abnormally less than steller wet-weather gripping. I do regularly carry up to 7 passengers and pull a loaded trailer so my next tires will be heavier duty. Judging by the other reviews and my own experience I would say that these tires are ok for lighter vehicles and light duty highway driving but not to be used on heavier trucks/vans under load bearing and adverse condition driving. I may buy Goodyear again, but not this model. I've had some good long-lasting Big-O tires, but the salesmen were always trying to talk me out of what I wanted and what was spec-ed for my vehicle. Seemed like they were just selling whatever they had in the store. Quiet,smooth ride,good milage. Visually attractive sidewall and tread design. Everything. No grip under any conditions, terrible tread design for water dispersement,slick/snow/mud grip. These tires are no good in anything but dry,clear roads. DO NOT buy these tires. If you are lucky enough to get a set for free like I did...SELL THEM and buy real tires. These tires are absolutely awful in ALL road conditions from dry,wet,slush,snow and ice. They have ZERO traction because the tread design is so poor and so smooth,all these tires do is spin and lose grip. These have got to be the absolute worst light truck truck/SUV tire on the market and I would steer clear of these tires at all costs. They are so poor under anything than dry road condition that they become a safety issue, even with 4 wheel drive. Goodyear needs to discontinue this terrible,terrible tire. All of which are MUCH more recommended than these awful Goodyear wastes of rubber. Like I said, frequent tire rotations have kept the tread appearing almost new. Significant sidewall cracking on all 4 tires at 40+K miles. After 43K miles, all four Goodyear Wrangler RT/S sidewalls have cracks running a complete circle around the tire 2 inches below the tread. Routine rotations have kept the tread itself in mint condition, so it's a bummer to have to consider purchasing new tires. I will upgrade to 10-ply tires as I do pull an 18 ft trailer several times a year. maybe the stock Wranglers can't handle towing loads well within the rated vehicle towing capacity? After readings these reviews, I was a little suprised... although these aren't the best "off-road" tires, they definately give you the mileage. I have over 95,000 miles and am finally trading them in for a new set (of the same tires). As with any product you have to trade-off some strengths and these are definately a "commuter" tire.